Some time ago we introduced both the WebAdmin and the WebUI. 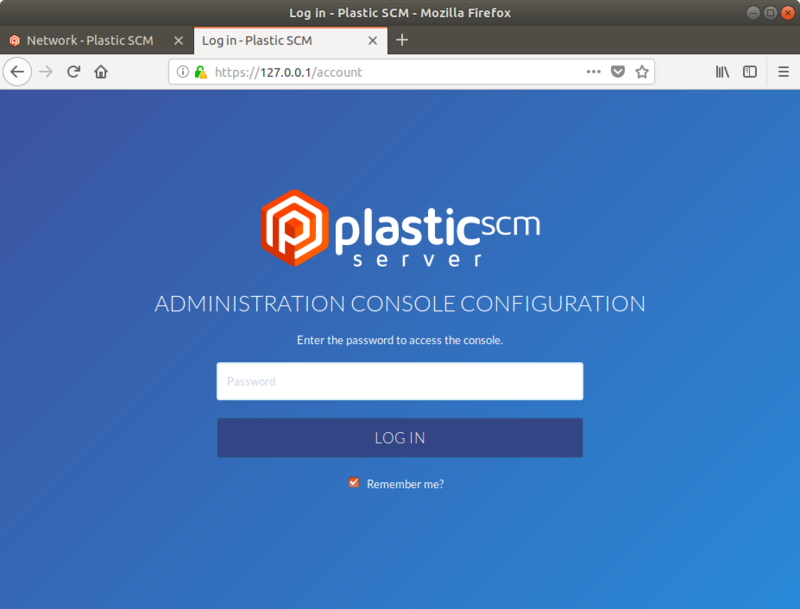 The first one is the Plastic SCM's server administration and monitoring web panel, while the second is a nice web interface to browse repository content (including code reviews and even semantic diffing!) 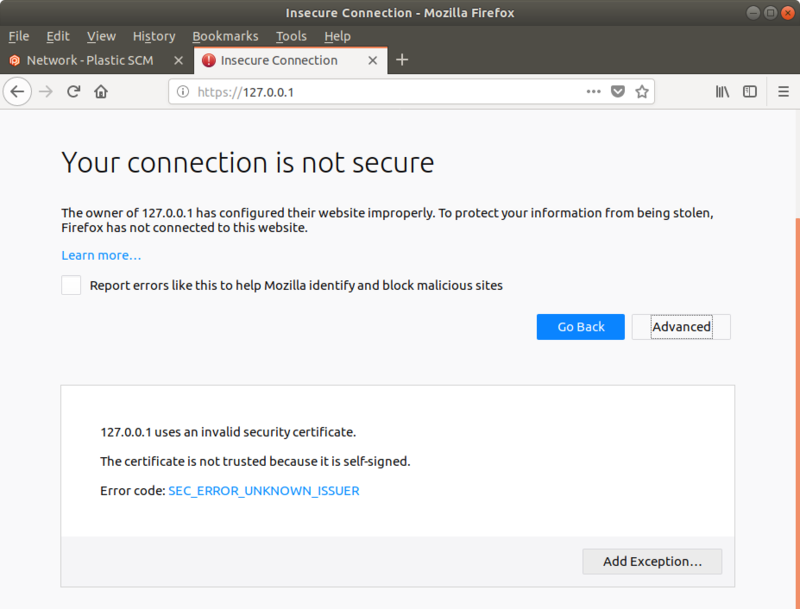 For now, both interfaces lack SSL. Our friend trx contributed in our forum with a quick guide on how to add SSL to the WebAdmin and WebUI using NGINX. In this blogpost, I'll walk you through an extended version of trx's guide, covering how to customize the WebAdmin's default port, install NGINX, generate a self-signed certificate (in case you don't want to invest in buying one from a trusted CA), and configuring NGINX to act as a reverse proxy for the Plastic SCM's WebAdmin and WebUI web interfaces, adding SSL support to them. For this guide, I'll use one machine only, but adjusting the URLs as necessary, you could use two: one machine would host the Plastic SCM server, and the other one, the reverse NGINX proxy. My Operating System of choice will be Ubuntu 17.10, but these steps should be valid (or easily adaptable) to the rest of UNIX-like OS, and even to other families such as Windows and macOS. In any case, what you need to understand is that the only traffic under HTTPS is between the user and the NGINX reverse proxy. The traffic between NGINX and Plastic's web interfaces will still use HTTP, so ensure that part of your setup is protected for your use case. You will obviously need a running Plastic SCM server. You will find the how-to guide to your platform on our downloads portal, but I added this step because there is something I want to point out. The key you're looking for in the image is WebAdminToolPort. If you decide to change the port, you will need to restart the server for the changes to take effect. You can find out how here in the Administrator's Guide. Please note that the StartWebAdminTool setting should also be set to true, which is its default value! And if you are using Windows, you will find the binaries on their download's portal. This is the last time I'll cover macOS and Windows, centering the rest of the post on Ubuntu 17.10. 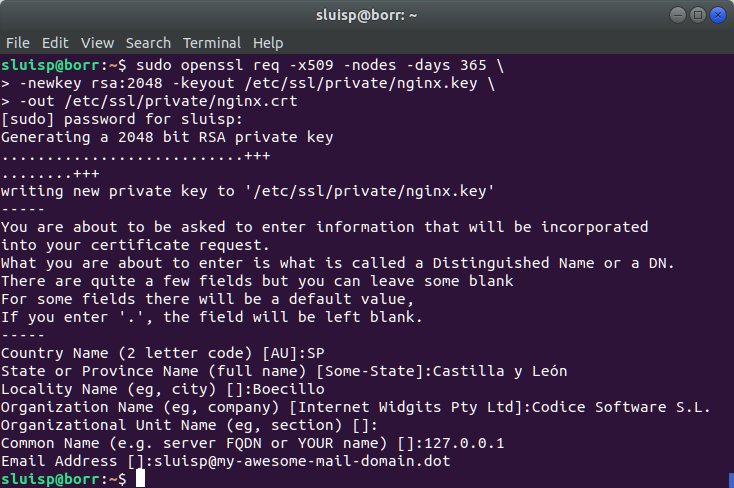 With OpenSSL, which is installed by default on Ubuntu 17.10, this should be as easy as executing a couple of commands. 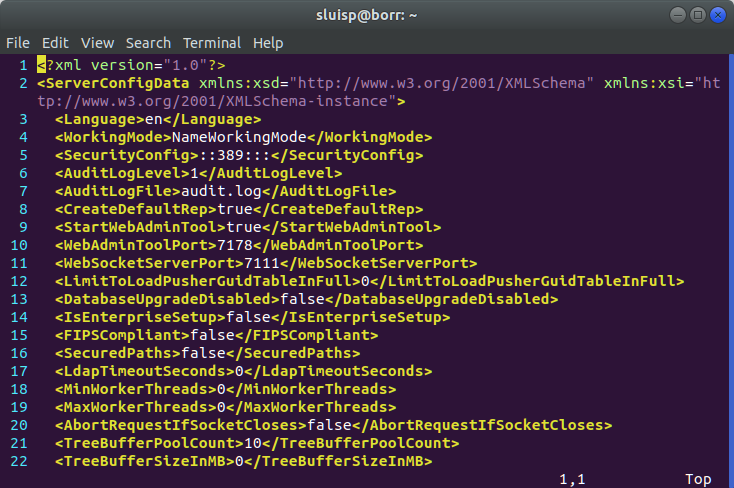 You can customize the output files part of the command but remember the paths you use! I followed the steps detailed at this awesome DigitalOcean's guide, where you'll find extended information. I'll only detail the most important bits here. The command will ask you to fill-in some fields. The most important one is the Common Name, which will indicate the domain(s) or IP addresses where the certificate is valid. For this example, I used the 127.0.0.1 IP, but yours could be a domain, or the machine name. Now, we'll create a Diffie-Hellman group. You can learn more about Diffie-Hellman in the SSL context in this nice security.stackexchange.com answer. It will take a while to complete, so be patient. 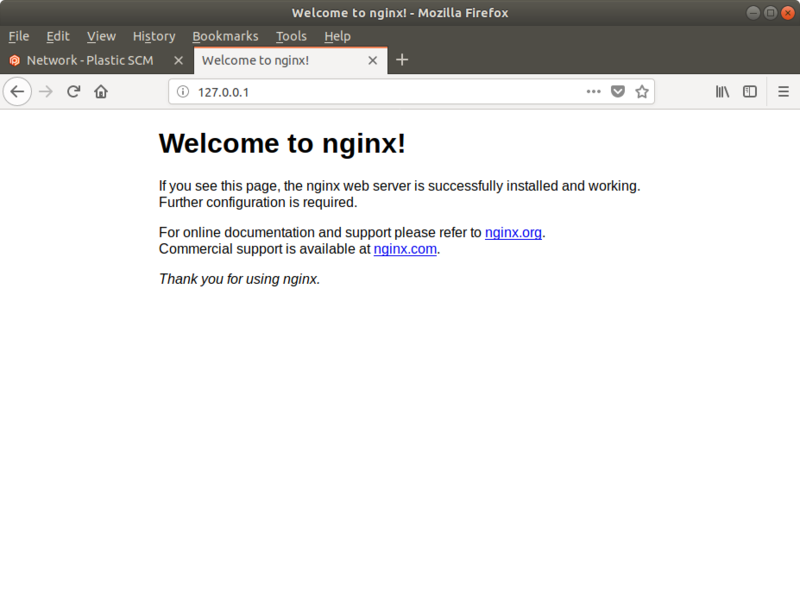 Once you're done, we can start configuring our NGINX install! Instead of putting all our configuration in the same file, we are going to split it, so it can be easily maintained and tweaked if needed. 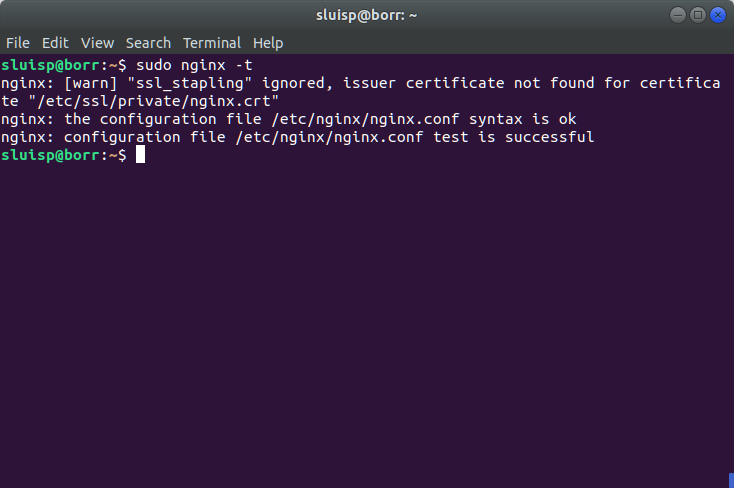 Then, we'll create a configuration snippet with the SSL configuration at /etc/nginx/snippets/ssl-params.conf. Following DigitalOcean's example, we also took the default configuration provided on Cipherli.st. You can copy and paste it if you want. Now, it is time to adjust NGINX so it uses these two files. Our main goal is to make it a reverse SSL proxy to the WebAdmin and WebUI, so if anyone tries to navigate under HTTP, we should redirect them to use the HTTPS version. With that in mind, we'll make a backup of our /etc/nginx/sites-available/default file and edit it. I'll paste here my entire configuration and explain the most important lines later. First, we configure the server name to the IP (or name, or domain) we configured on the SSL certificate. Then, we'll return a 302 moved temporarily to HTTPS if someone tries to navigate through the insecure version. If everything works OK, you can change the 302 for a 301. On the second server section, we tell NGINX to listen to HTTPS through the default port for the protocol, including the snippets we created before. The last and most important part is the location one, where we indicate that when users navigate to the root path (/) it should act as a proxy for the WebAdmin URL. Please note that the first warning is OK. Because we signed our own certificate, it can't use OCSP stapling. Now, we are ready to restart the NGINX service! If everything went OK, now you can navigate to https://127.0.0.1, and the WebAdmin should load under HTTPS. As always, if you have any problems or doubts, don't hesitate to get in touch through the comments, on Twitter at @plasticscm, or through email, at support@codicesoftware .com. We'll get back to you soon!